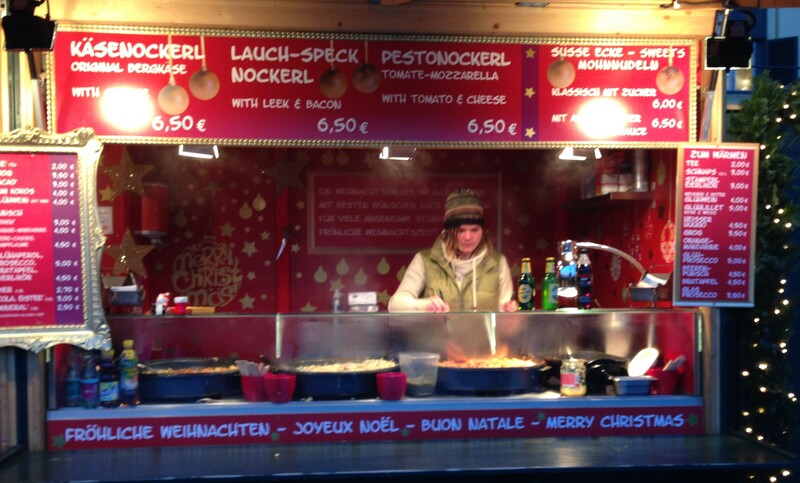 Since we have been busy traveling the past few week-ends, we have been able to experience the Christmas Markets first hand. 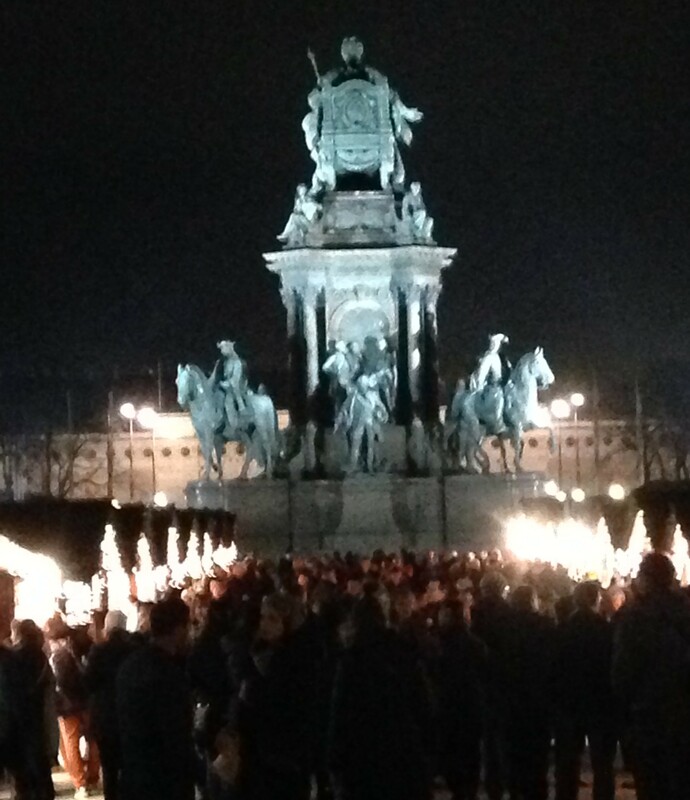 Our first experience was at Schoenbrunn Palace in Vienna. We arrived on a Friday afternoon to view the Palace, so having the market there was an added bonus. 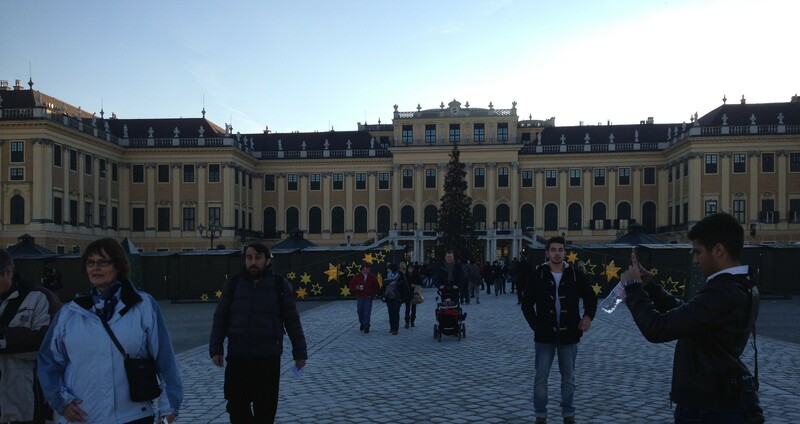 First we toured the Schoenbrunn Palace….where we found out a few interesting facts about the family that lived there. 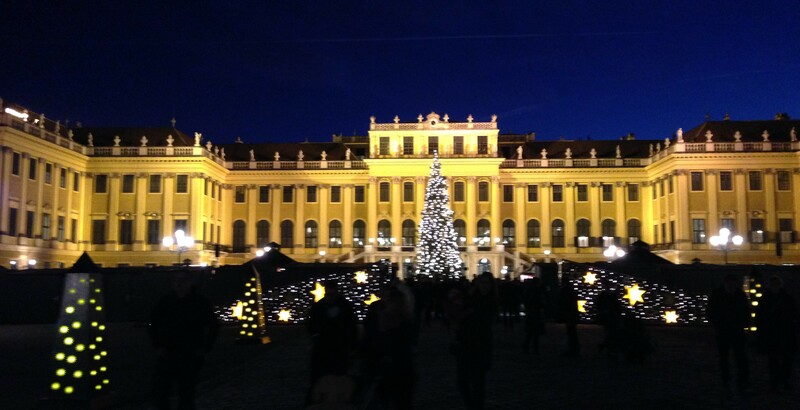 Schoenbrunn Palace was the summer home of Emperor Francis I and Empress Maria Theresa. Marie Antoinette was their youngest daughter. Yes, the one that had her head cut off by guillotine during the French Revolution. Her great niece, Marie Louise, was married to Napoleon Bonaparte…all in the name of a “political marriage match”. 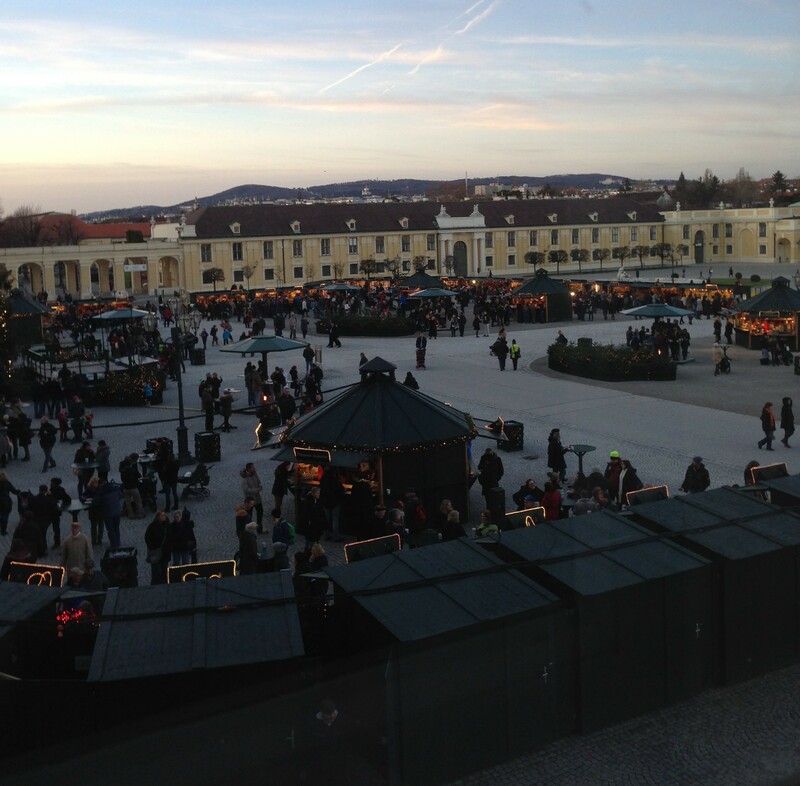 But enough history…Exiting the Palace we got this view of the Christmas Market in the Palace courtyard. 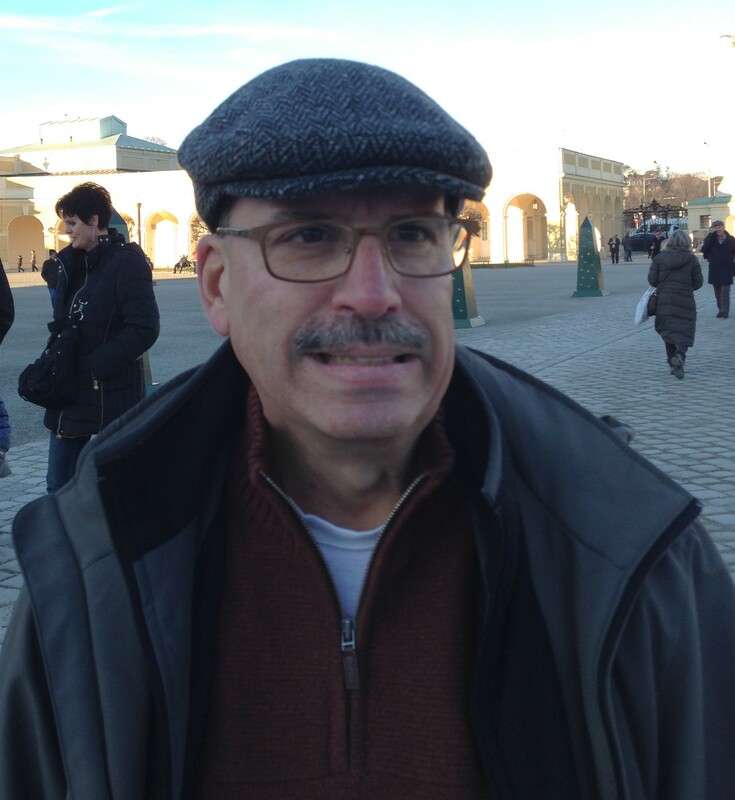 And this is David….gritting his teeth because I want to “shop” at the market. 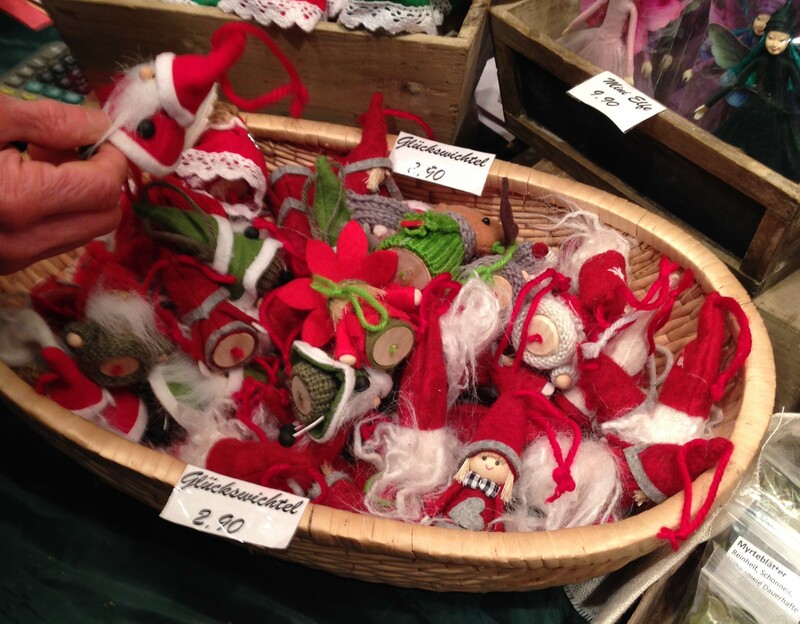 After dragging him around the stalls where I ooohed and ahhhed over all the handmade items like these woollen angels (engels) ….and these hand carved wooden bowls, spoons and other kitchen items… and these cute little Santa gnomes… or these tiny Santas…. 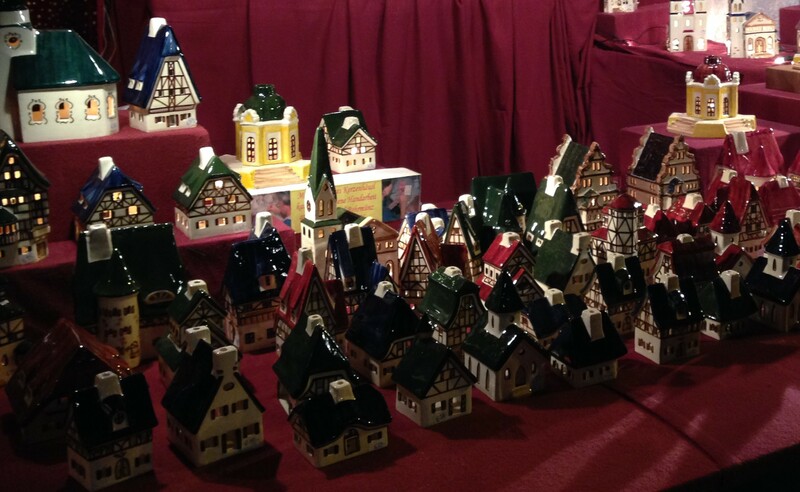 or these ceramic houses….one of which might just be coming home in my suitcase! David soon realized that there was something for him! For every “craft” booth we passed there were food ones too. 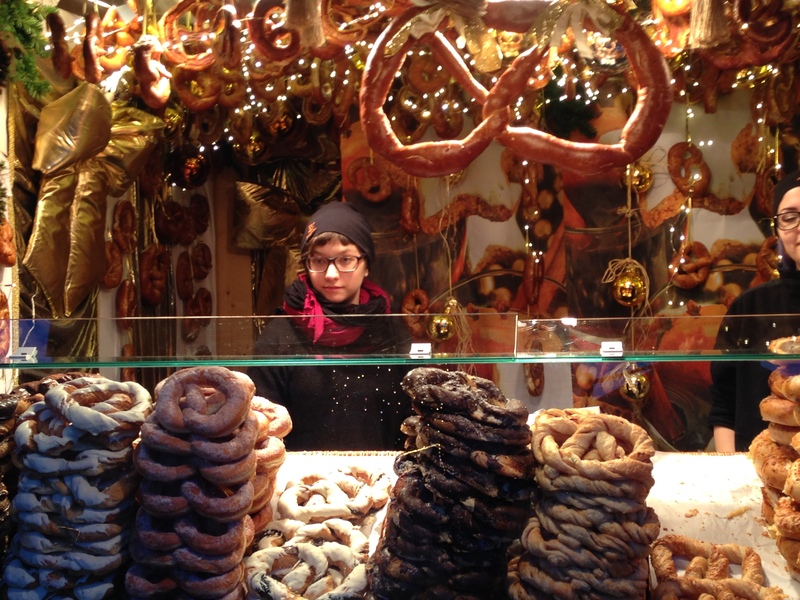 The huge pretzels were his favourite…. I think he might have drooled on the counter….we tried the chocolate covered one. 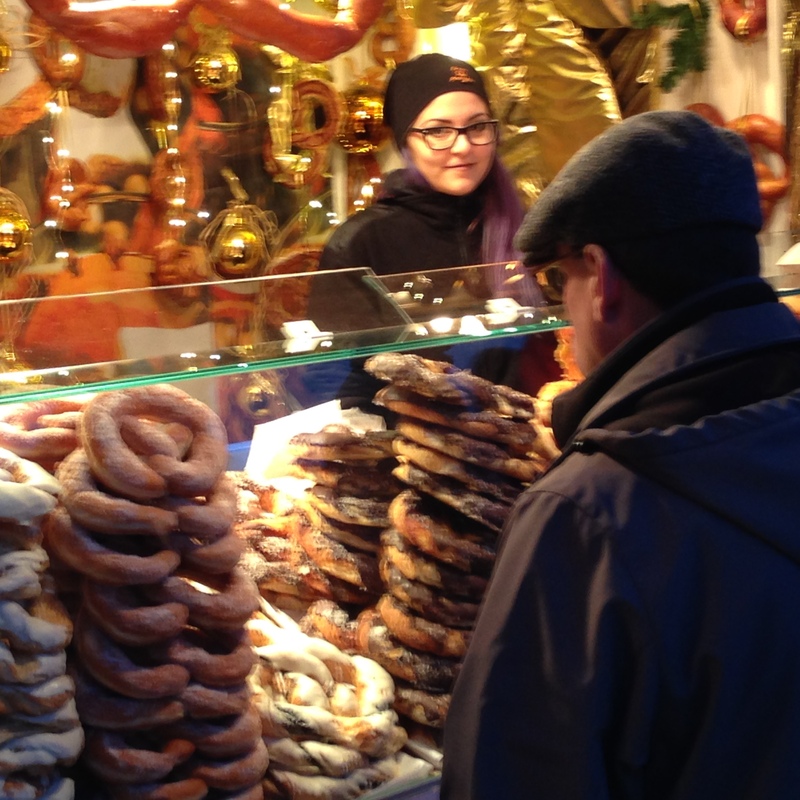 But there were also booths with freshly roasting chestnuts, spiced potato wedges, cheeses of all kinds, sausages, fresh breads and pastries, their version of pizzas… and these “scrambled pancakes” and dumplings filled with fruits and meats. 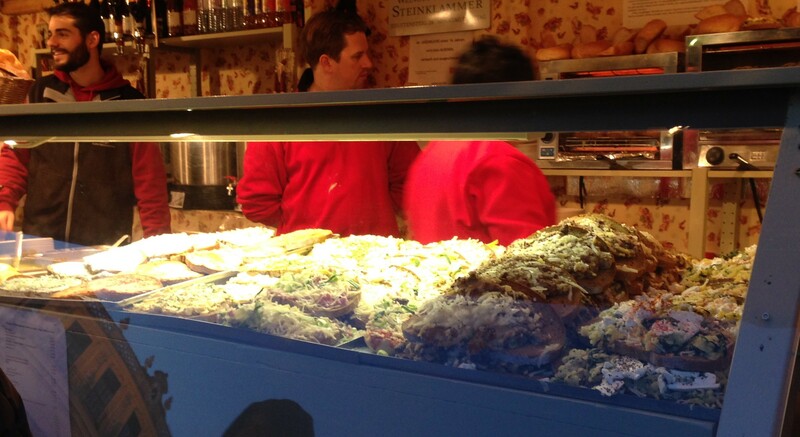 All cooked right in front of you! The darker it got…the more people there were. We left about 4:30 or 5:00 p.m. (yes, it gets dark early here! 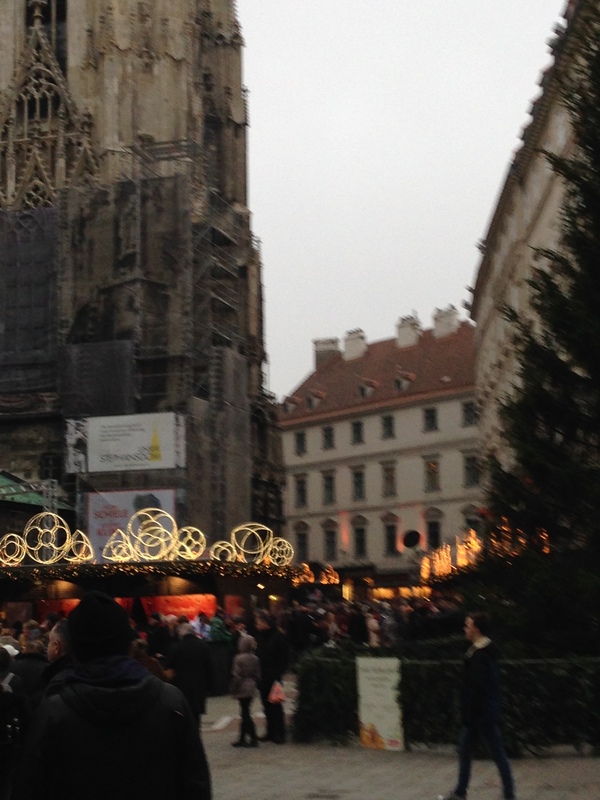 ), deposited my treasures in our hotel and then went to the Museum District of Vienna where there was another market and it was definitely more crowded. 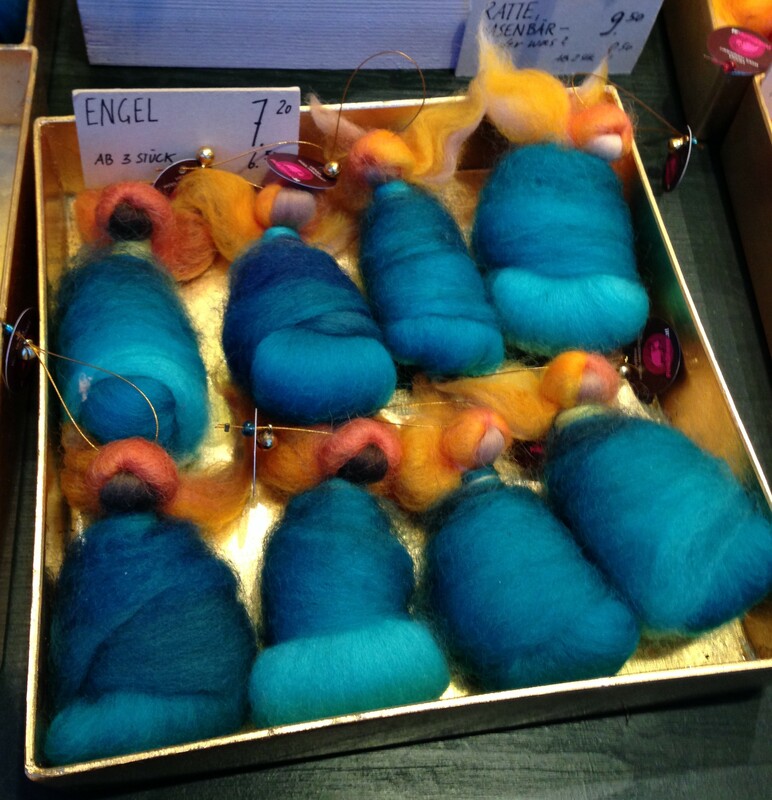 There were also different craft items too…so of course I had to look here too! 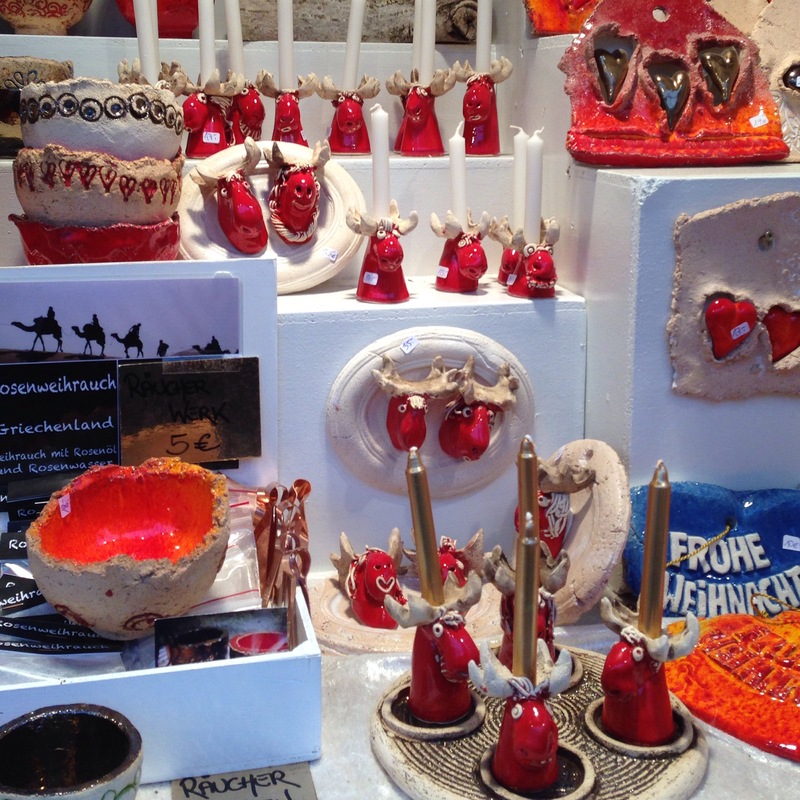 How about an Merry Christ-moose Advent Candle holder? 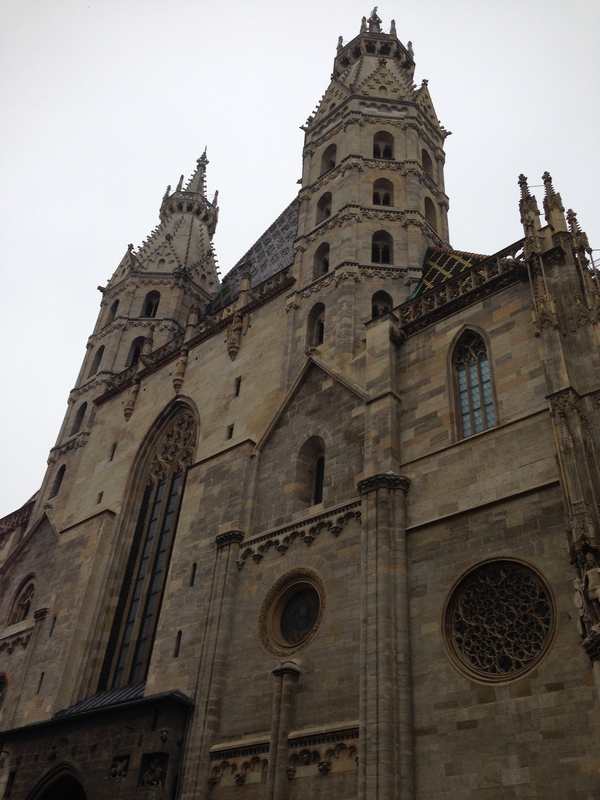 On Sunday before we left, did some more wandering around Vienna. 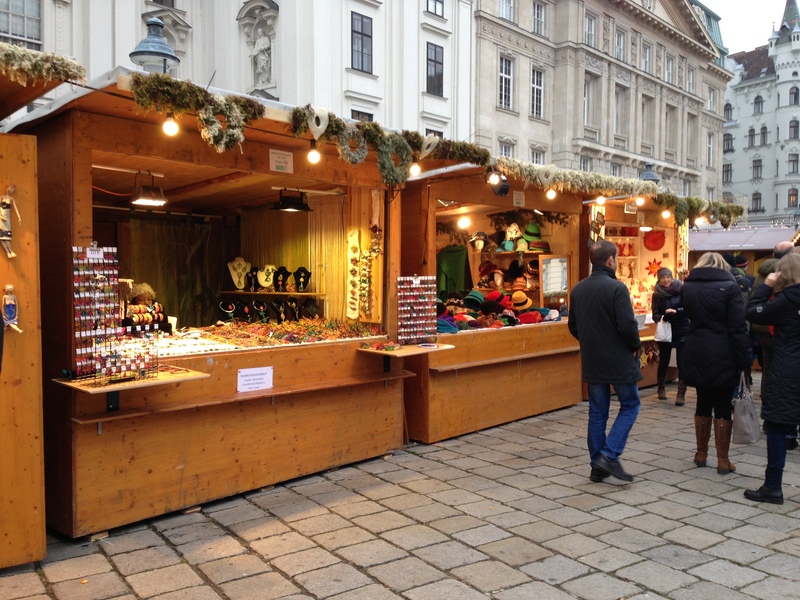 In just about every church square there was a Christmas Market. 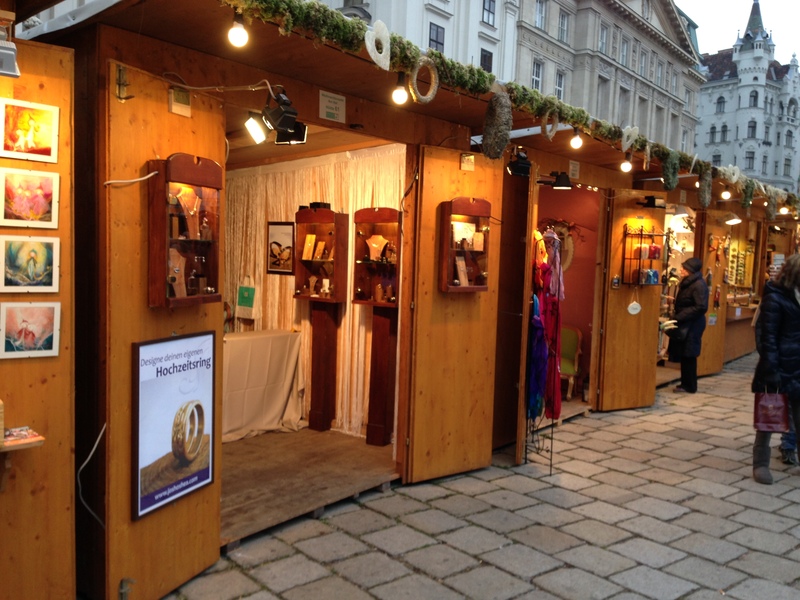 Most of the market “stalls” are dark brown wooden sheds…these were a little different as you could actually walk in. 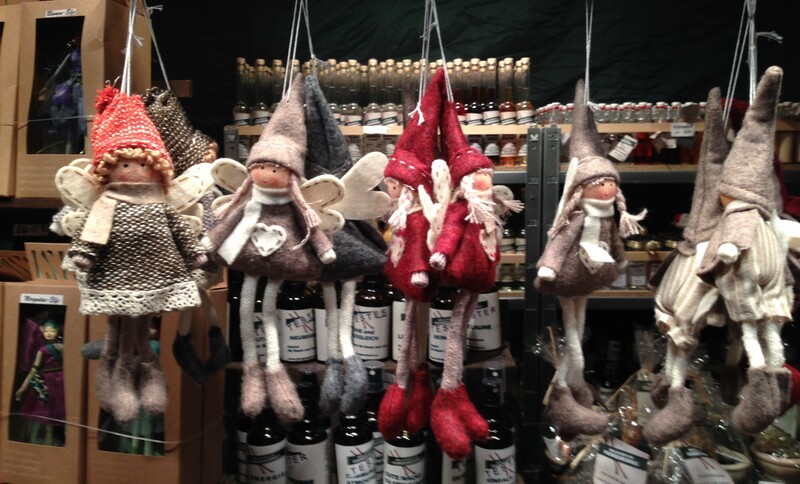 and the crafts items were a little different too. Lots of hats and jewellery. 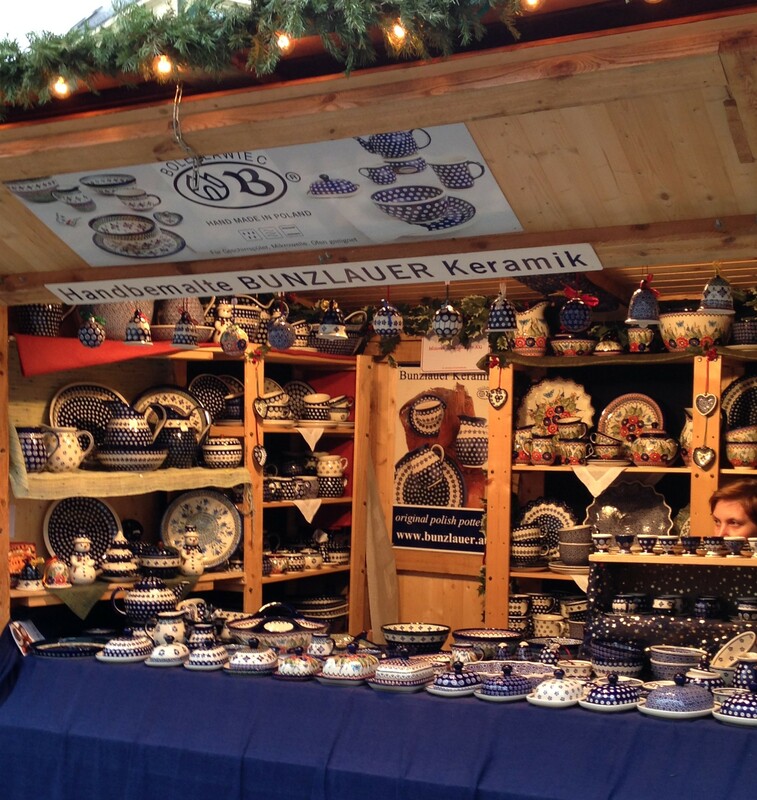 And this is where we found an entire booth full of Polish pottery! 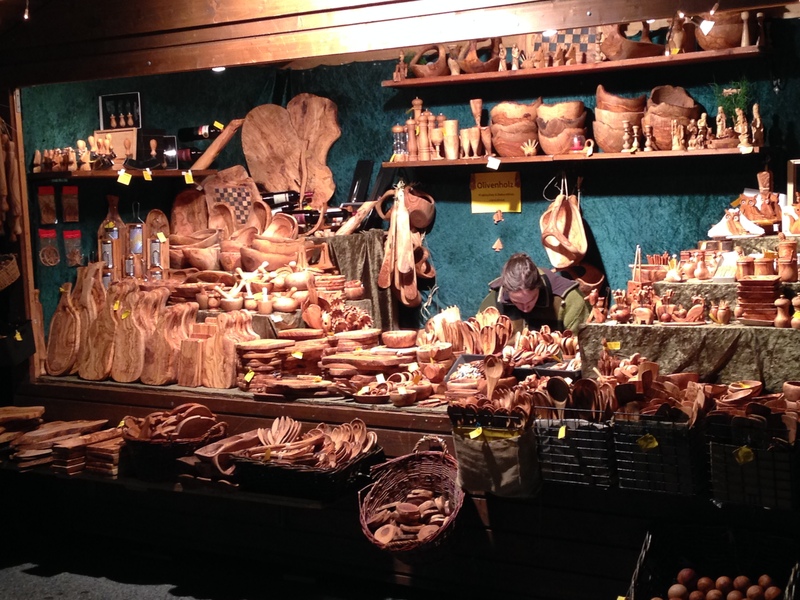 (handmade, but handmade in Poland!) 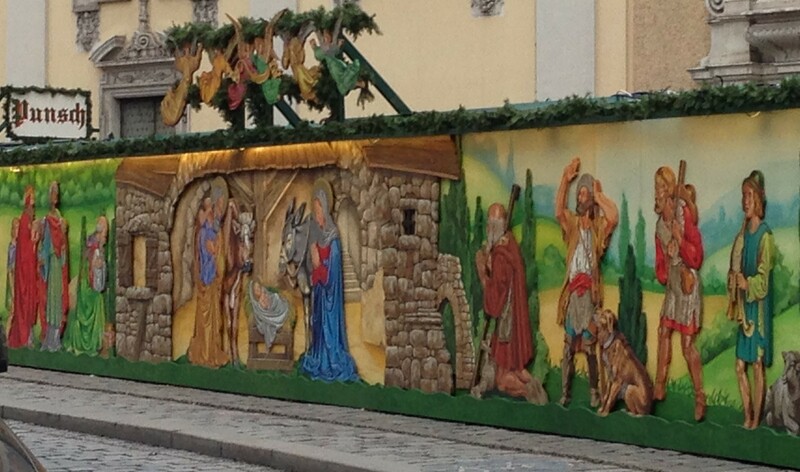 The prices here were also much more than in Poland. It pays to know when a deal is NOT a deal! I wish I had a close up of these lighted “domes” below. 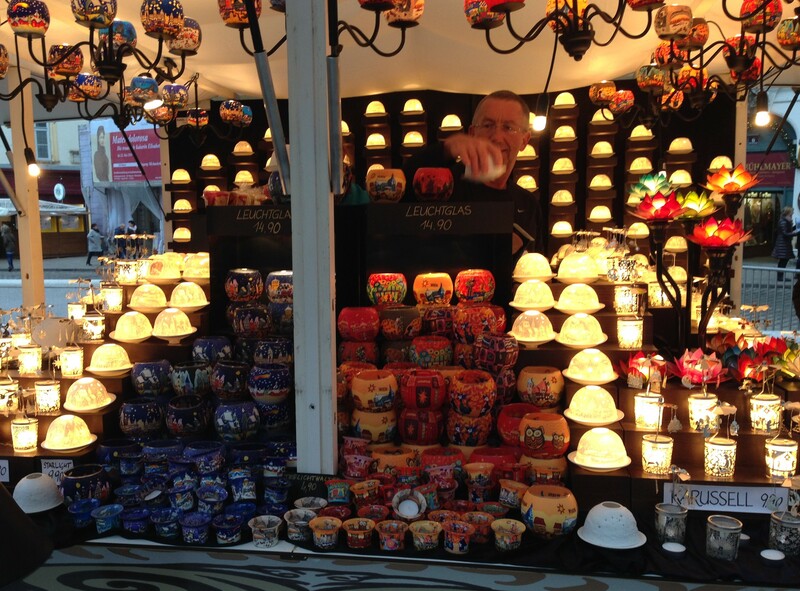 They are a thin white ceramic domes that cover a lighted candle (or fake candle bulb) that are etched with different designs…like the manger scene, stars, ballet dancers, churches, etc. and who knew you could make purses out of zippers? 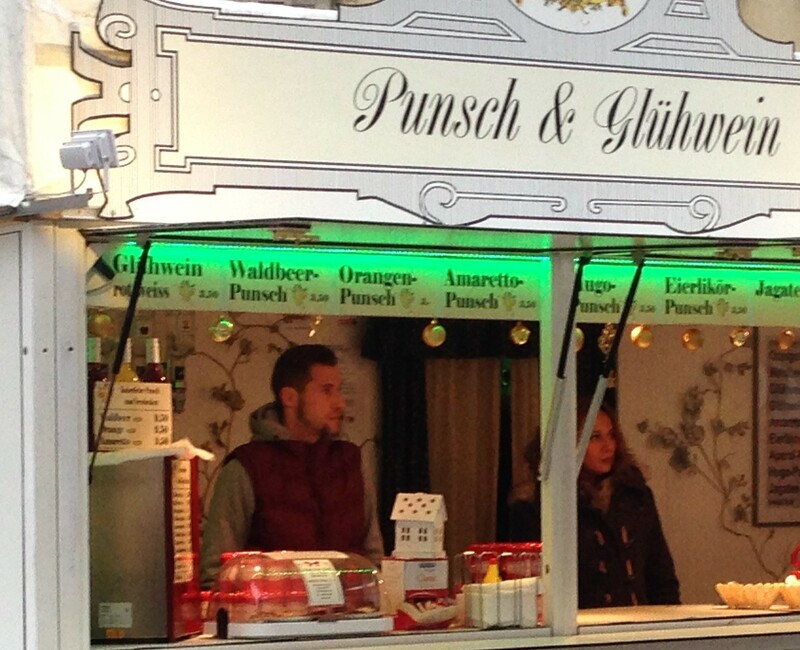 and don’t forget the most important part…or why most people come…the Gluhwein or “mulled wine”….or for those not inclined for alcohol, there is also “Kinder-punch”. 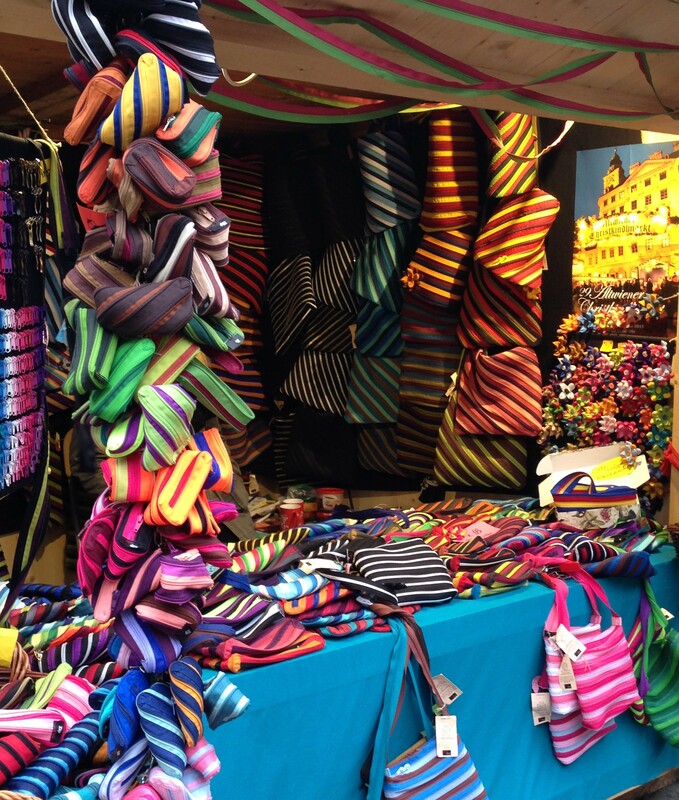 Just about every market has their own “mug”. Lots of people collect the mugs. And at some markets, you can return the mug for a partial refund. Snuck that one in one you, didn’t I? 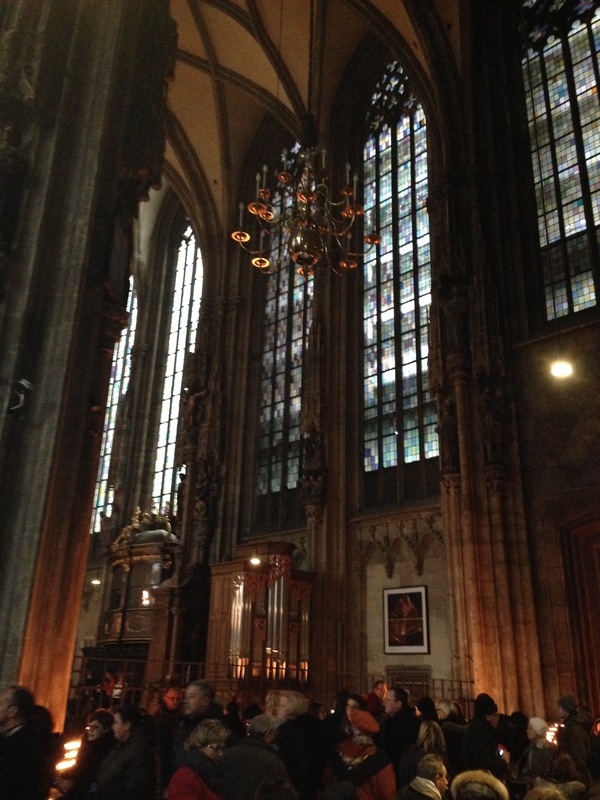 You didn’t seriously think I could do a post without showing you a church did you?? 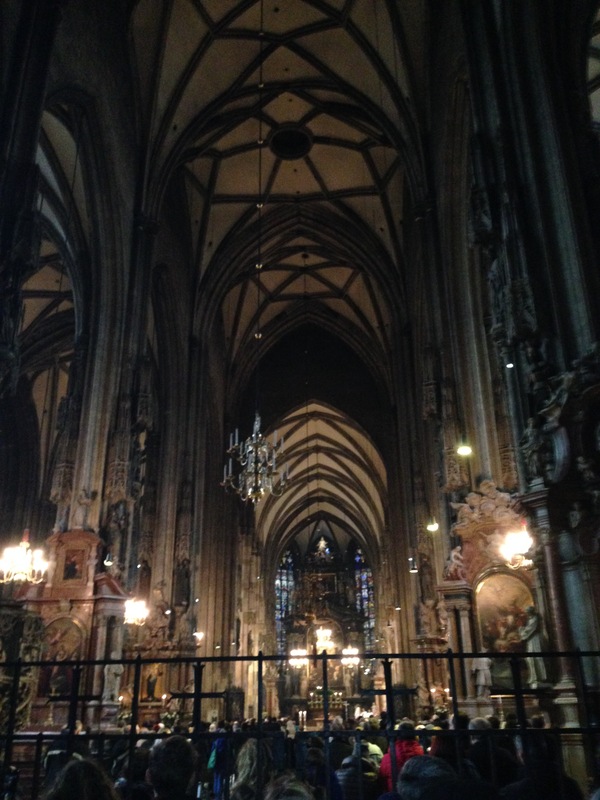 Just count yourself lucky, we visited 6 churches that day, but this is the biggest and best. 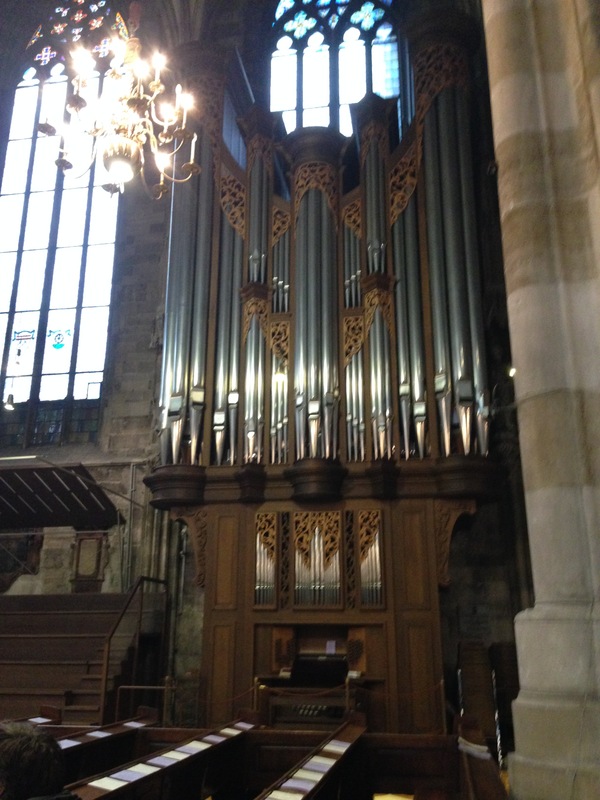 A fun trivia fact for you about this church: Composer Ludwig van Beethoven discovered the totality of his deafness when he saw birds flying out of the bell tower as a result of the bells’ tolling but he could not hear the bells. 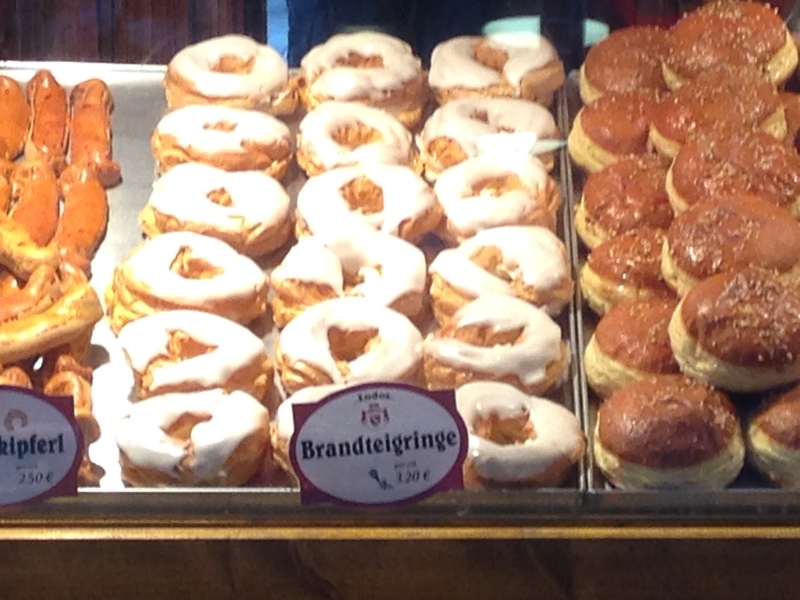 And just to leave your mouth watering….The goodies weren’t just in the Christmas markets…in case you didn’t get enough, you could grab one of these outside the entrance to the train station. Yummy, melt in your mouth good!